Raith Rovers went into today’s game looking to get back to winning ways after their 7 game unbeaten run was ended by the home defeat to Rangers last week. Livingston on the other hand are adrift at the bottom of the Championship and have lost their last three games. 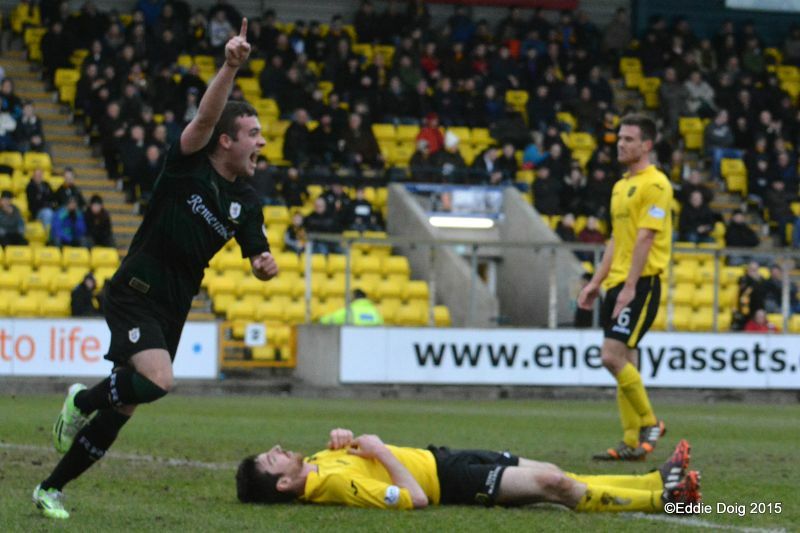 In addition to this, the Rovers were keen to avenge their horror 5-1 defeat at home to Livingston in December. There were 4 changes to the Rovers team from last week, in came Craig Barr to make his long awaited Rovers debut after his injury hit season, Barrie McKay came back into the team after missing the Rangers game along with Liam Fox and Lewis Vaughan, who had not started a Rovers game since August, but with Christian Nade suspended and Calum Elliot still injured leaving the Rovers short on strikers this was Vaughan’s opportunity. Dropping to the bench for Rovers were Hill, Conroy & Moon. Rovers kicked off towards the car park end at the cold & windy Energy Assets Arena, which was lacking in any atmosphere as the usual noisy corner of home support were low in numbers and missing their drummer. 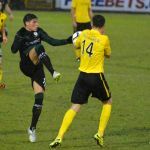 Livingston had the better of the early exchanges culminating McKeown’s clearance falling to Sekajja but his shot was saved by McGurn. Vaughan & McKay produced some neat passing to set up Stewart on the left but his cross was too high. After a fairly evenly matched first 15 minutes, Rovers took the lead in spectacular style. 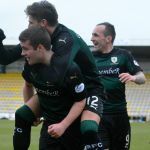 Ross Callachan ran onto the ball 25 yards out from goal and unleashed a sweet first time strike into the far corner of the goal giving Jamieson no chance. 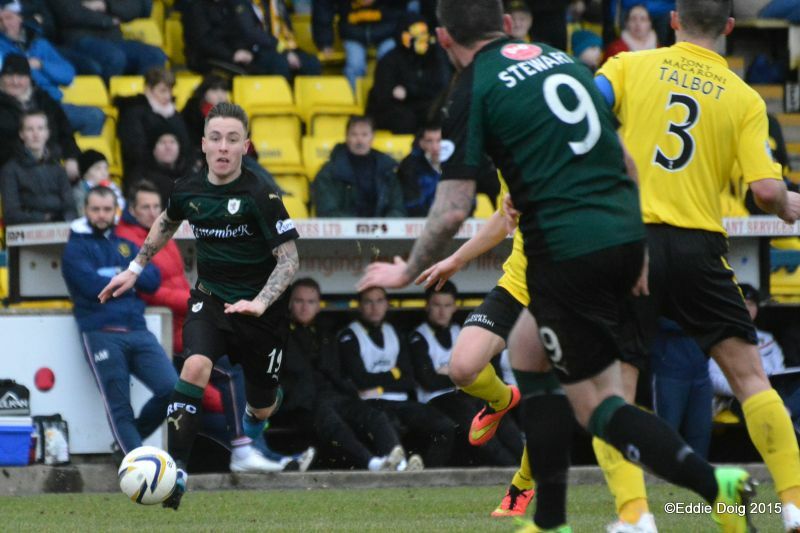 Ross may have scored his first Rovers goal against Falkirk a couple of weeks ago but Rovers fans have been willing Ross to score a long range screamer for the last year as he has come so close on so many occasions, but this time he did, Livi 0 Rovers 1. The goal put an extra spring in the step of the Rovers side, Grant Anderson particularly, with a strong run and cross that went out for a corner. From that corner, the ball came to Anderson on the edge of the box and his volley from 20 yards was well saved by the Livi goalkeeper. In the 21st minute, Liam Fox also had a long range shot that went just wide. The Rovers pressure continued and after some neat passing between Vaughan and Callachan, the ball was fed to McKay who raced to the byeline, sent in a low cross that Lewis Vaughan coolly slotted home to make it 2-0 for Rovers. In the space of 6 minutes, Rovers had completely taken charge of the game in terms of both possession and a commanding 2 goal advantage, however Livi were keen to get right back into the game. McGurn saved from Gallagher, then a Livi free kick was cleared off the line by McKeown. Rovers were soon back on the attack and Stewart was sent through and sent an accurate low drive to the far corner which Jamieson saved with his foot and sent the ball just wide – the referee then bizarrely gave a goal kick when it was a clear corner. 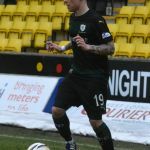 Livingston finished the first half in the ascendency with chances for Talbot & Mullen but the Rovers defence held firm. This was a solid first half performance from the Rovers against the wind, with some clinical finishing from Callachan & Vaughan giving Rovers a solid 2-0 lead. As the second half approached, both the floodlights and the heavy rain came on. Livi made 2 subs at half time with Hippolyte & McKenna coming on for Sekajja & O’Brien. The second half conditions were not conducive to free flowing football as the wind & rain added to the cold wet conditions. 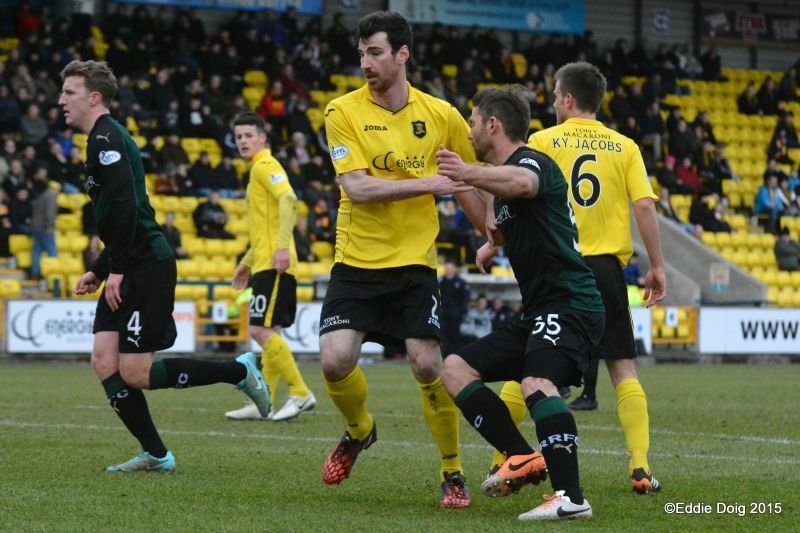 It was Livi who adapted better as they tried to force their way back into the game. Kyle Jacobs hit a shot high and wide after a period of Livingston possession, Livi seemed to be adapting a shoot on site policy but through some blocks by the Rovers defence and McGurn saves they held firm. 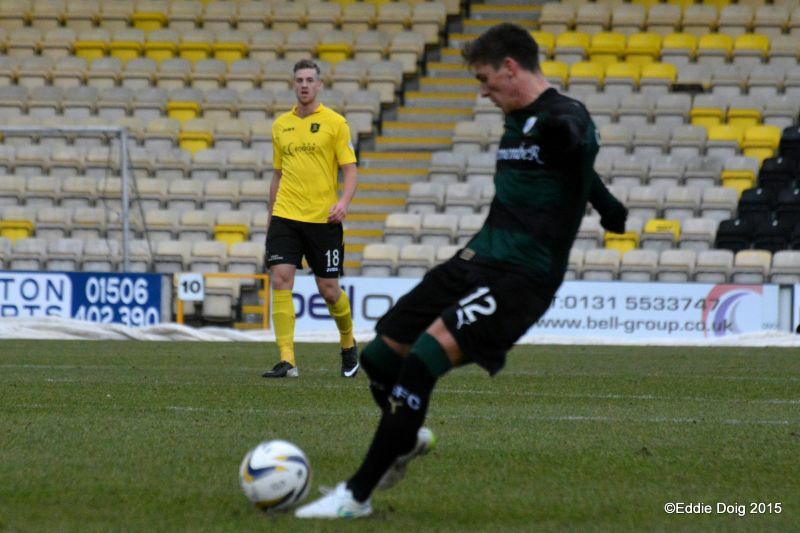 The chances kept coming for Livi though, with McKenna’s volley just going over the bar. Rovers started to get back into the game in the 55th minute with a McKay cross just saved by Jamieson in the Livingston goal just as Lewis Vaughan was ready to pounce. Then Callachan put Mark Stewart through and he hit a rasper of a shot from 20 yards that whacked the underside of the Livi crossbar. Raith again coming so close to making it 3-0. Back came Livingston as Hippolyte struck a shot that went straight into McGurn’s hands, Keaghan Jacobs had a shot, again saved by McGurn, then Hippolyte again had a chance but headed over the bar when it looked easier to score. 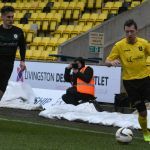 McGurn was again called into action with a superb double save as he punched away a Livi free kick and then saved the ball in amongst the ensuing stramash from the feet of Gary Glen. Raith made their first substitution in the 73rd minute with Conroy coming on for the industrious McKay. From a Conroy corner, Anderson shot, Jamieson could only parry but Vaughan’s shot went wide. 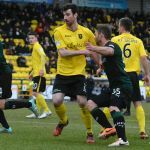 In 78 minutes, Livingston were down to ten men as Talbot looked as though he had a nasty facial injury and had to be taken off but with having used all 3 subs already, they had to continue with ten men. 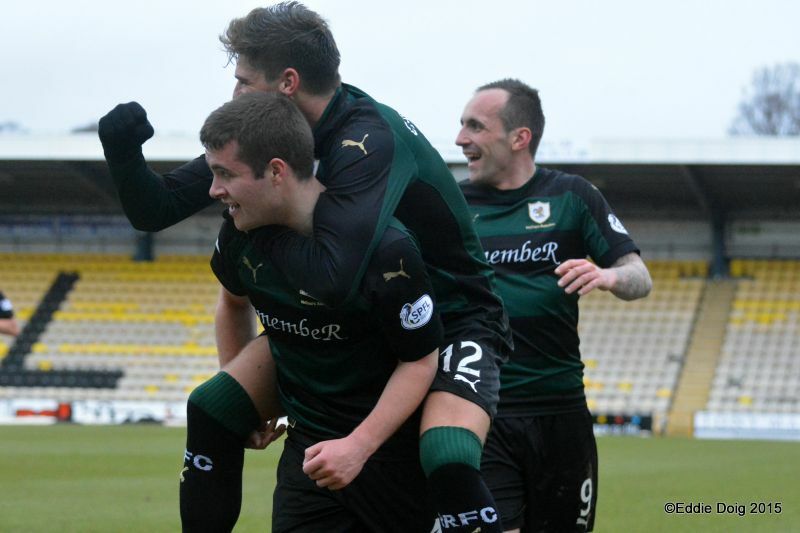 In the closing minutes, Scott came on for Raith with Vaughan going off, and Livingston came close with chances for Hippolyte and Mullen, but the Rovers held on comfortably enough for the win. 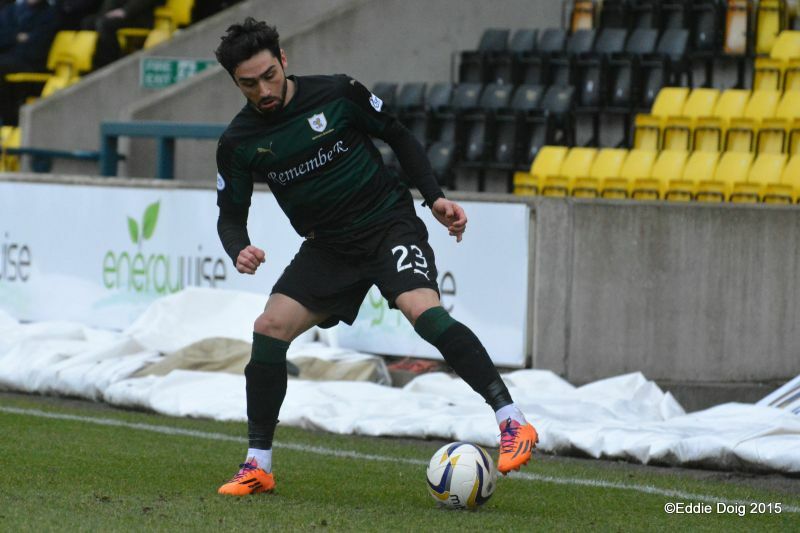 Full Time, Livingston 0 – Raith Rovers 2. This was a solid win for Raith with the game effectively over after the first quarter of the game. Livingston created more chances that Rovers over the course of the game but never really looked like scoring. There were some really good performances in the Rovers squad notably from Ross Callachan, Barrie McKay and Craig Barr, but overall a good team performance to win at Livingston for the second time this season. This result sets Raith up nicely, as they go into the big Scottish Cup quarter final tie at Inverness next weekend with only one defeat in the last 9 matches. Welcome to the Energy Assets Arena, it's overcast and a chilly wind sweeps over the pitch. Rovers looking to bounce back after a narrow defeat against Rangers last week. 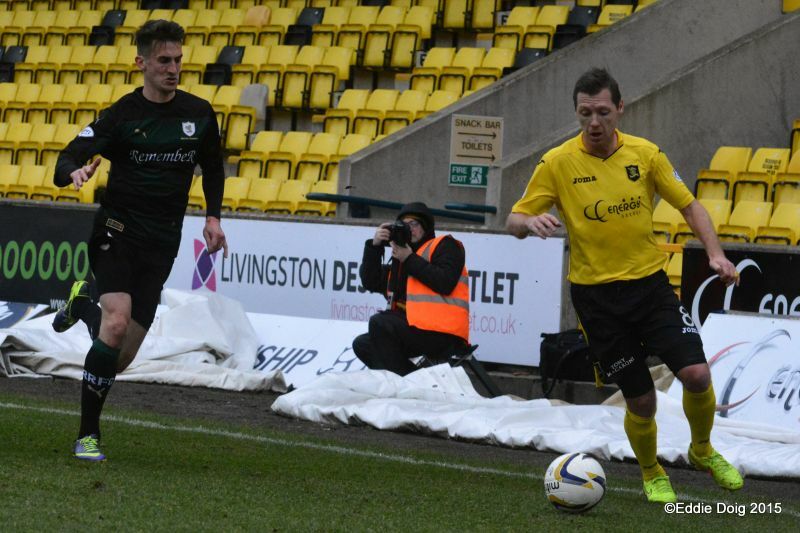 Livingston hoping to get back on the rails, their last victory was on Christmas Eve. Livingston kick off towards the car park end. Ky Jacobs winning a corner, crosses in, Barr initially clears but the ball comes in and Sekajja batters the ball off the legs of McGurn who dives to collect the ball. 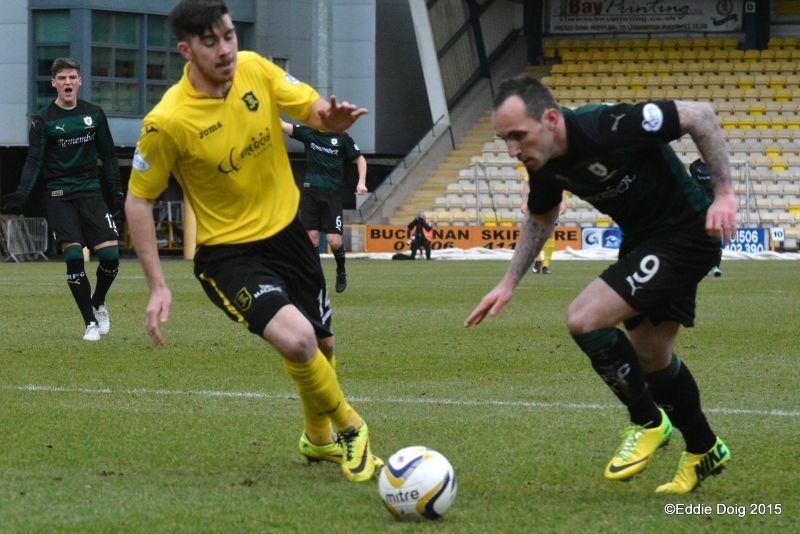 Stewart and Vaughan combine, the latter denied by the legs of Sives. 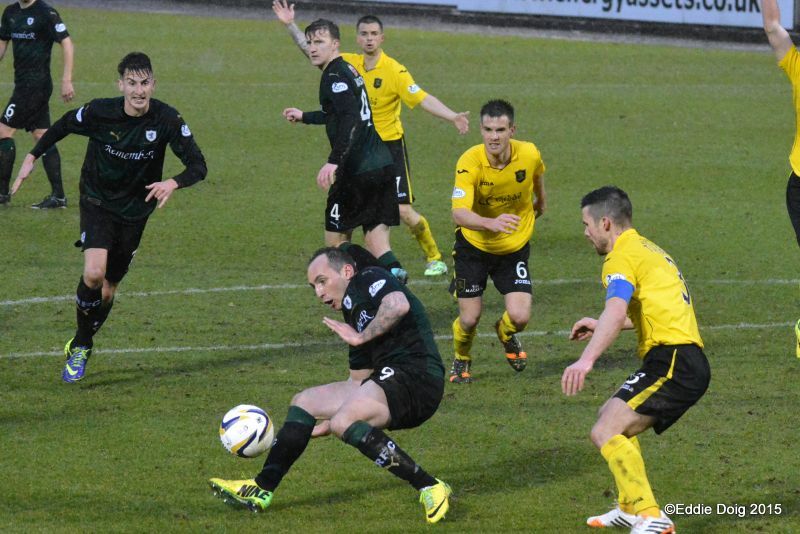 McKay and Vaughan combine, the ball going to Stewart whose cross was wayward. The away support shout for a free kick as Anderson ends up on his bahookie. Rovers building play well enough, but not breaking through in the last third. Great build up by the Rovers midfield and forwards sees Callachan fire a rocket from 25 yards past the diving Jamieson. GOAL ROVERS. Ooft, Anderson with a shot from the edge of the box stings the hands of Jamieson, forcing a corner. Fox having a go from range, a deflected free kick fell to him but lacked power. Great build up seeing McKay the provider and Vaughan bullets home from 6 yards. GOAL ROVERS. Gallagher coming close, forcing McGurn into a diving save. An O'Brien free kick comes off the wall to Ke Jacobs his shot calling on McKeowan to clear off the goal line. McKay with a timely chip released Stewart whose shot is deflected by Jamieson and strangely Mr Robertson awards a goal kick. Rovers keeping the ball in the middle, denying Livingston space. Ky Jacobs yellow for a foul on McKay. 972 souls in the stadium today. Jordan White leaps highest but his header drifts well wide of goal. 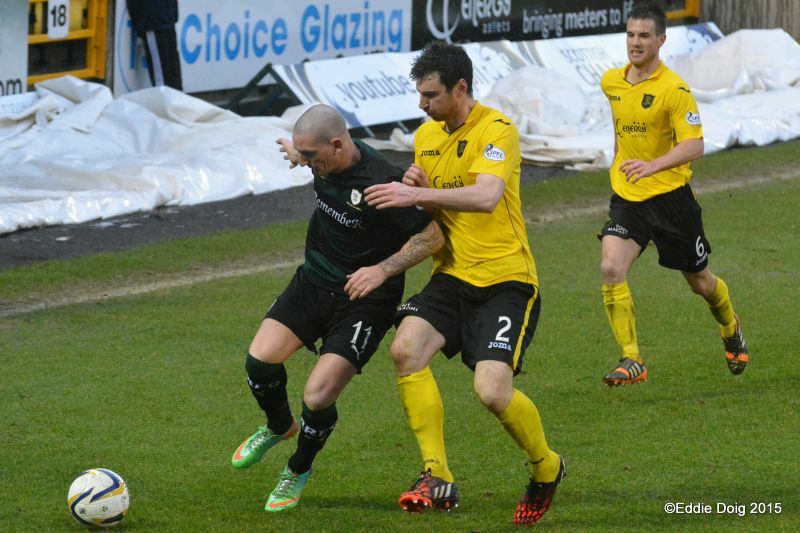 McGurn rushing out to grab the ball from the on rushing Sekajja. McKay and McKeowan get bogged down on the right wing and Sekajja clears up field. Livingston having a succession of shots from outside the area but each time the ball is repulsed by the sea of green and black. It has started to rain now, let's hope it doesn't dampen the pace of the game. O'Brien and Sekajja off, Hippolyte and McKenna on. Rovers on the attack straight from the kick off. The rain is now chucking it down. McGurn forced to punch clear to deny the approaching Hippolyte. McKenna coming close with a shot from distance. Jamieson in action this time, denying Vaughan at the 6 yard line. Stewart coming close to scoring, hitting the underside of the bar from 15 yards. The ball is cleared up the park and Hippolyte drives the ball into the arms of McGurn. Ke Jacobs has a shot, Davie gets a hand to it and clears. Watson's looping header lands on the roof of the net. Conditions slippery under foot for both teams. Mullen showing his frustration at being offside. McGurn claws at the ball from a free kick, the ball finally cleared by Watson. Livingston looking the hungrier of the tw sides at the moment. Thomson runs back to head clear a high ball. McKay off Conroy on. White off, Glen on. Hippolyte yellow for tripping Anderson. Conroy sees his free kick spin off for a corner, Vaughan shoots wide from said corner. Talbot receiving treatment on the pitch. Looks like the Livingston doctor has been called for. Talbot going off on a stretcher putting Livingston down to 10 men having used all three subs. 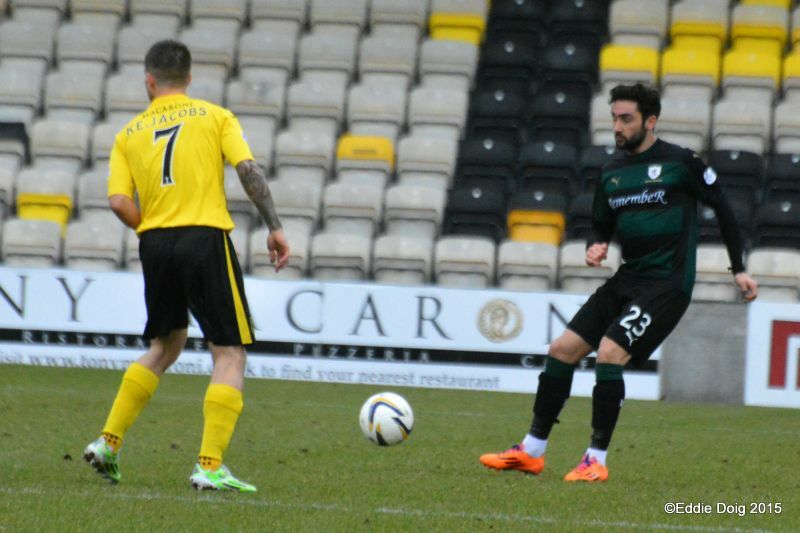 Livingston pressing despite the disadvantage. Hippolyte through but is denied by Thomson who is promptly dumped into the hoarding by Hippolyte. Anderson down but gets up limping. Stewart puts Anderson clear, he shoots from the right of the box and Jamieson saves with his outstretched legs. +1 McGurn coming out to catch Mullen's cross. +2 McGurn again, this time saving from Mullen's 20 yarder. Jamieson, Sives, Talbot, Ky Jacobs, Ke Jacobs, O'Brien, Gallagher, Praptotnik, White, Mullen, Sekajja. Subs, Walker, Hippolyte, Beaumont, McKenna, Glen, Pittman, Rutherford. McGurn, Thomson, Watson, Fox, Anderson, Stewart, Callachan, Vaughan, McKay, McKeowan, Barr. Subs, Cuthbert, Hill, Moon, Scott, Conroy, Robertson, Matthews. Lewis Vaughan shot blocked byCraig Sives. 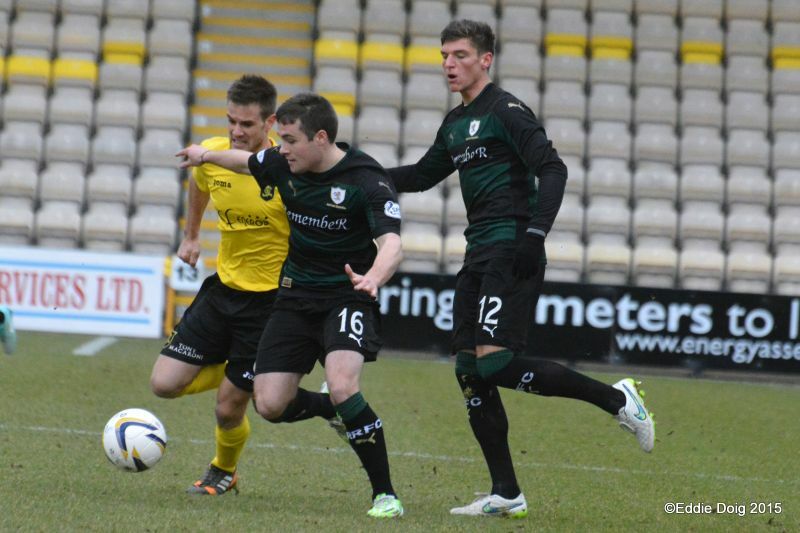 Mark Stewart goes past Declan Gallacher. Stewart fires across the box. Ross scores from twenty yards out. 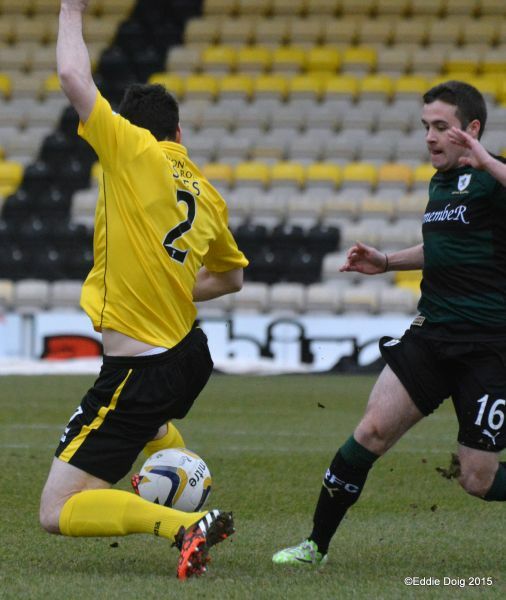 Grant Anderson splits the Livingston defence. Craig Barr and Paul Watson in the Livingston box. He shoots he scores "Lewis Vaughan"
Mark Stewart and Barry McKay. Rory keeps his eyes on the ball. 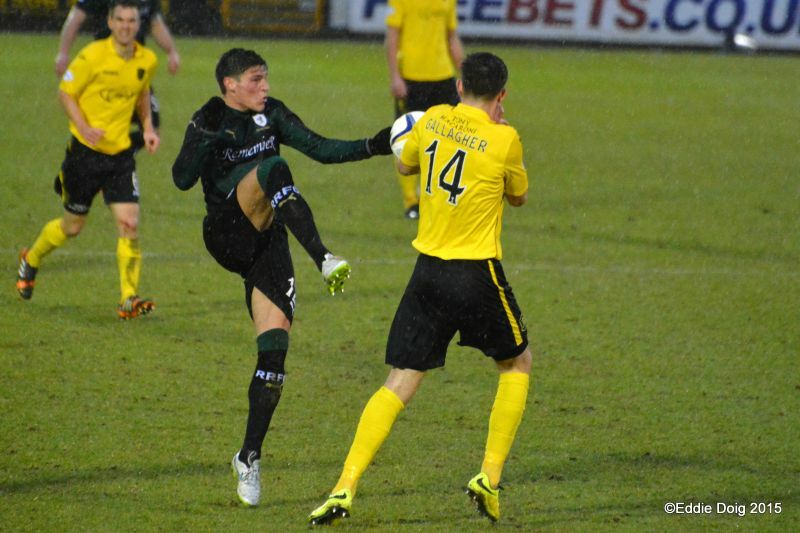 Ross Callachan fouled by Kyle Jacobs. Mark Stewart unlucky not to score. Grant Anderson races through the Livingston defence but Myles Hippolyte pulls him back. Martin "Jimmy" Scott came on late in the match. Raith Rovers head to the Energy Assets Arena for the second time this season, and they’ll be looking for their second win at the venue, against a Livingston side who are desperate for points. Mark Burchill’s team are currently marooned in last place in the Championship table, six points behind ninth placed Cowdenbeath, who also have a game in hand. Burchill replaced former manager John McGlynn at the end of last year, and after an impressive run of results over January and February, came within three points of eighth placed Alloa. However, a sequence of three consecutive defeats, has seen them fall further off the pace. 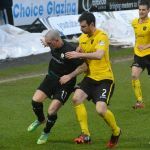 The 34-year-old player-manager has added to his squad recently, with former Rangers, Partick Thistle and Morton defender, Darren Cole signing until the end of the season, while Scott Pittman has made the step-up from Junior football after signing from Boness. 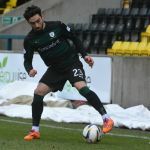 The West Lothian outfit also boosted their forward options during the transfer window, after signing Ibra Sekajja, following his release from Inverness Caledonian Thistle. Raith Rovers have enjoyed mixed fortunes in this fixture this term, with a Martin Scott goal enough to take all three points in the first meeting in September. 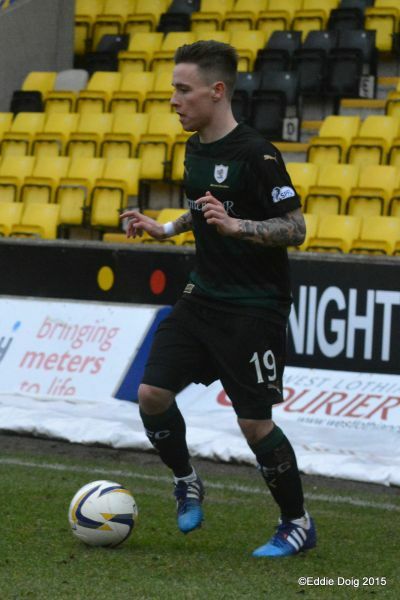 However, the return game at Stark’s Park in December, was notable for a dismissal for Ross Perry in the opening moments, which preceded a heavy 5-1 defeat at the hands of a Lions side which were at that point, still under the stewardship of McGlynn. Raith have a poor record against Livingston, with just three wins out of their last ten meetings, compared to Livingston’s six. Fans could possibly take some solace however, in the fact that on the 16 occasions Raith have played on the 28th February, they’ve only tasted defeat on three occasions. The history of the fixture suggests that one of the teams will have all three points come Saturday evening, with just three of the last 20 meetings finishing all-square.